In our current “size matters” challenge, we’re asking customers to send us screen shots of their Arcserve UDP environment. The response has been fantastic, and we thank all who have participated. 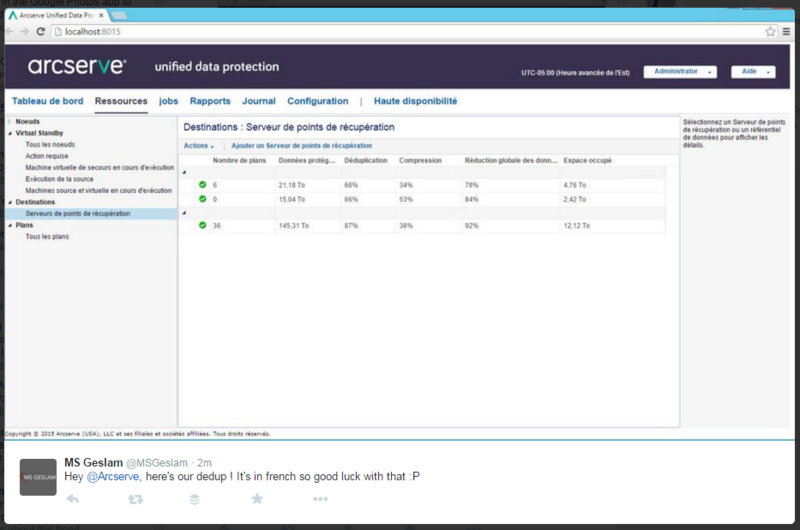 Within Core DataCloud’s Arcserve UDP, a customer can view one of the management screens to see the level of deduplication and compression that’s performed on its core component, the Recovery Point Server, as well as how much storage has been saved when compared to the amount of data backed up (“source data”). Because Arcserve UPD leverages global, source-side deduplication, users are able to achieve a very high degree of storage savings. Think of it as modern deduplication vs. the older style target deduplication that requires expensive appliances. These screenshots are from current customers; there wasn’t any tweaking in the lab, and only server information was redacted to preserve customer privacy. With Arcserve UDP supplied by Core DataCloud, customers can achieve high levels of storage savings whether their environments are small or very large.